Allow me to begin this review by telling you, in no uncertain terms, that I adored The Cemetery Boys. Every now and then I will come across a book that is just a very Emily book. The Cemetery Boys was one of those books! It had all the things I like: a great sense of place, realistic characters, a group of bad boys, mental health issues and surprises I didn’t see coming. Stephen is forced to move from Denver to the painfully small town of Spencer, Michigan after his mother is committed to a mental institution and his father goes broke. Living with his grandmother that hates him, Stephen begins to explore his father’s hometown and learns about the town’s urban legend…that during the “bad times” nightmare-esque creatures require a human sacrifice. At first, Stephen doesn’t believe, but after hanging out with twins Cara and Devon he starts to question whether the bad times are an urban legend or if the creatures are real. My favorite thing about The Cemetery Boys was Devon and his crew of bad boys. Every night they get drunk in the town cemetery, aptly called the playground, and break a few laws. My favorite types of characters are those that live in the moral gray area and all of these boys, especially Devon, do. The boys in this story reminded me a little bit of Kavinsky and his gang in The Dream Thieves, one of my all time favorite books, so I loved them all the more. This novel also deals with mental illness. Not only is Stephen’s mom in a mental institution. Cara and Devon’s mother is the town crazy and Stephen questions his sanity because he can’t figure out if the “bad times” creatures are real or not. I really enjoyed that this novel always kept me on my toes! I was never sure if the urban legend of the “bad times,” and the nightmarish creatures, were real or not real. I was surprised right up until the last page. 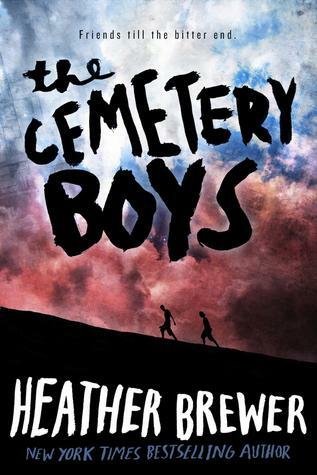 Overall, The Cemetery Boys was my kind of book. From the subject matter, to the characters, to the setting I was completely immersed in this story. Do yourself a favor and grab yourself a copy of this novel now, I have a feeling it’s going to be a on a lot of 2015 favorites lists! After reading the synopsis on this book, I thought I would enjoy it. I am elated to see that you did. I have to read this book now. Stellar review!